Left activists have decided to target big business, as well as the government. 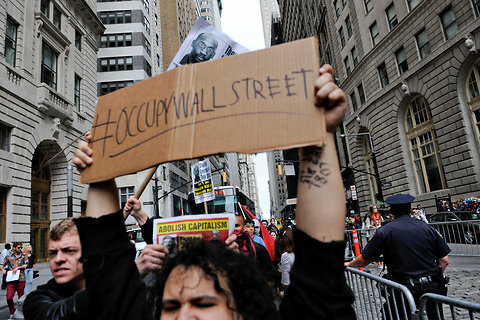 Yesterday, in an event that was months in the making, (at least) hundreds have attempted to occupy Wall Street. Announced by the anti-corporate group, Adbusters, the hacktivist group, Anonymous posted a youtube video in support. Over time, others joined in, organizing around the event. On September 17, 20,000 of us will descend on Wall Street, the iconic financial center of America, set up a peaceful encampment, hold a people’s assembly to decide what our one demand will be, and carry out an agenda of full-spectrum, absolutely nonviolent civil disobedience the likes of which the country has not seen since the freedom marches of the 1960s. From our encampment we will launch daily smart mob forays all over lower Manhattan … peaceful, creative happenings in front of Goldman Sachs; the SEC; the Federal Reserve; the New York Stock Exchange … and maybe even, if we can figure out where they’re being held, at the sites of Obama’s private $38,500 per person fundraising events happening somewhere in Manhattan on Sept. 19 and 20. With a bit of luck, and if fate is on our side, we may be able to turn all of lower Manhattan into a site of passionate democratic contestation – an American Tahrir Square. Calls for the action circulated on all sorts of social media, including Facebook, Youtube, and Twitter, the event as been widely publicized. But no one applied for a permit. As a result, New York police were well-prepared to deny access to most of the area (NY 1 Reports). As with most large actions, people with many different perspectives are participating. The New York Times that both anarchists and followers of the proto-fascist Lyndon LaRouche (singing patriotic songs) also attended–with their own plans and purposes. It seems clear that it will be very difficult for any group to control the message that comes out of this event, and for this reason, the larger groups have stayed away. United for Peace and Justice, for example, has announced a broad anti-corporate campaign, kicking off next week, which lists many events–but not the Wall Street demonstration. This entry was posted in Uncategorized and tagged Adbusters, Anonymous, antinuclear movement, corporations, Lyndon LaRouche, New York, police, Wall Street. Bookmark the permalink.